The What: Matrox Graphics Inc. has expanded its capture card and video wall portfolio. The Matrox Mura IPX 12G-SDI capture and IP encode/decode cards are the product range’s inaugural set of SDI cards, while the Matrox Mura IPX 4K DisplayPort capture and IP decode cards extend the already-available DisplayPort-based offering. The new Mura IPX capture cards now allow OEMs and system integrators to mix and match a premium selection of 12G-SDI and 4K DisplayPort 1.2 and HDMI options to seamlessly capture, stream, and record desktop and video wall content to local and/or networked video walls. 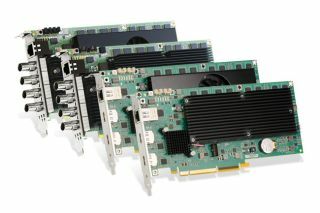 The What Else: Featuring unrivaled SDI support from a single card, the Matrox Mura IPX SDI cards boast two 12G-SDI and two 3G-SDI connectors to capture a wide range of SDI sources. These cards also include a dedicated onboard network interface controller (NIC) for high-density encoding and decoding of up to two 4Kp60, four 4Kp30, eight 1080p60, sixteen 1080p30, or exponentially more SD streams. The Mura IPX 12G-SDI cards are available in passive and active cooling options. The Bottom Line: Matrox Mura IPX 4K DisplayPort capture and IP decode cards in both passive (part number: MURAIPXI-D2MHF) and active (part number: MURAIPXI-D2MF) cooling versions will be available in Q1 2019, while the Matrox Mura IPX 12G-SDI capture and IP encode/decode cards in passive (part number: MURAIPXI-E4SHF) and active (part number: MURAIPXI-E4SF) cooling SKUs will be available in Q2 2019. To learn more about these new cards, contact Matrox Graphics.